Not only for the first time in 108 years did the Cubs win the World Series they also brought home their first Commissioner's trophy. 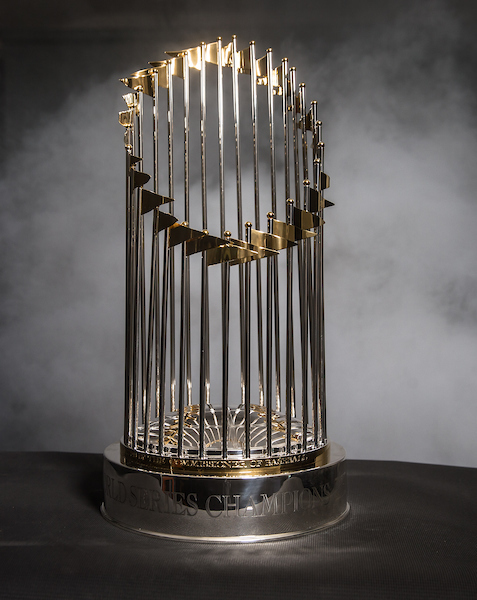 You might have seen that in the post about the White Sox and their World Series victory in 2005 as their championship emblem contained the commissioner's trophy. 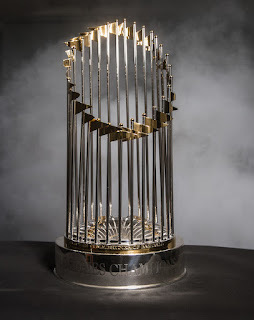 BTW, I should add having won two world series themselves in the early 20th century - like the Cubs - in 2005 the Sox also brought home their first commissioner's trophy. So as of 2016 both Chicago teams have their own trophy to show for their respective victories. Not sure what they have to show for their earlier victories before a trophy was devised. The trophy has a similar meaning as the Stanley Cup or Vince Lombardi trophy. I did posts where I explained the history of both especially the Stanley Cup as far as the Black Hawks. It was first awarded in 1967 and before that time if you won the world series in previous you didn't get a trophy. Basically one would get rings for winning the world series just as most athletes get rings today. I unfortunately didn't go the parade and rally in Grant Park for the Cubs but many fans got a glimpse of the trophy on Friday. An estimated five million came to Chicago to celebrate the Cubs first world series victory since the early 20th century. Now that I've take care of this need to write about this it's time to look for other topics. I still can't believe the Cubs finally won one!!! Also I found this article that questioned some of Cubs Manager Joe Maddon's moves with his bullpen during the final two games of the series. The article will claim that the manager choked but the team itself didn't. That article had the only good photo I could find of any Cub with the trophy in their arms.